We often hear the terms power washing and pressure washing being used interchangeably. But are they really the same thing? Or are they completely different? It might seem a bit confusing, but we’re here to help clear things up, once and for all. As far as the water pressure is concerned, they both use similar amounts of pressure. How much pressure really just depends on the type of machine; a household unit won’t offer up as much power as an industrial machine. If we’re talking strictly about the types of the machines, there is one key element that differentiates a power washer from a pressure washer: a heating element. Both machines create a powerful stream of high-pressure water, but a power washer also heats up the water. This might seem like a small difference, but it actually makes a huge difference in how each is used. 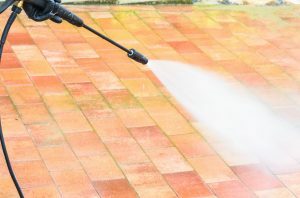 A power washer uses a high-pressure stream of very hot water to blast away dirt and materials from outdoor surfaces. The combination of high pressure and the temperature of the water make it better at removing all those truly stuck on materials from surfaces. It’s great for removing residue like salt, mildew, and mold from outdoor patios, decks, driveways, and more. The added heat also makes it particularly good at removing things like chewing gum from sidewalks. 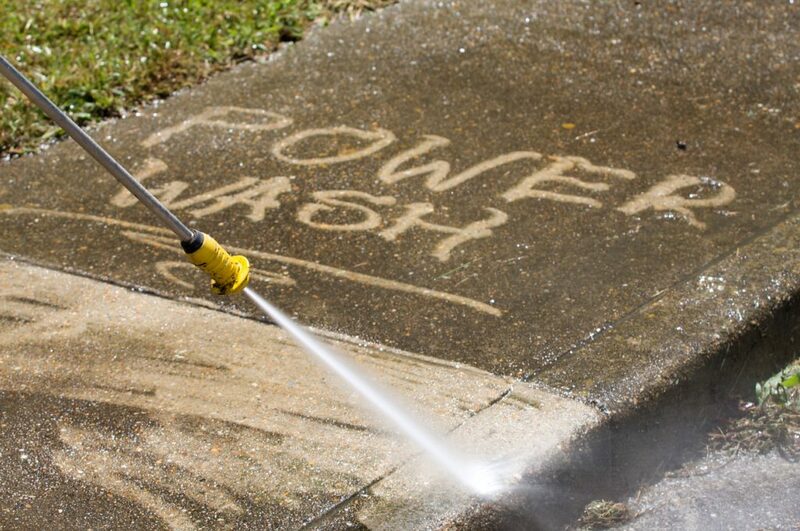 Power washing is also exceptionally great for handling grease stains on driveways or garage floors. It’s also useful for helping to control weeds and moss—the powerful blast of hot water can kill them and stop them from growing back right away. Power washing is ideal for any situation where the surface is heavily saturated or has a lot of dirt or other matter to clean off. Essentially, power washing is the more heavy duty option. Pressure washing is what you’ve most likely used at your home before. It uses the same high-pressure water blast as power washing but doesn’t use heated water. This regular temperature water still does an amazing job at blasting away dirt but doesn’t perform as well against moss, mold, or other tough stuck on substances. It still does an amazing job, but might not be able to get rid of tough stains on concrete. So, now that you know the main differences between power washing and pressure washing, it’s time to figure which one you need for your home. Which method you use depends entirely on the job. For any larger jobs, like a large commercial space or an extra big driveway and patio space, go with power washing. The heated water usually helps to make the job go faster since the heat helps to loosen up the dirt. For that same reason, though, you have to be careful which surfaces you use it on. 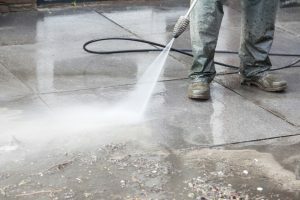 It’s best to stick to concrete and other hard surfaces when power washing, since the force of the hot water can do damage to softer surfaces. Whichever type of cleaning method you decide to do, keep in mind that it’s always best to hire a professional to take care of it for you. If you’re not properly trained on how to use a pressure washer or power washer, you could end up damaging the surface you’re working on. It’s better to be safe than sorry!